Flames N Games ASTRIX UV Thud Juggling Balls set of 5. Pro 6 Panel Leather Juggling Ball Set + KIDJo Ball Juggling DVD of Tricks (5 languages) & Travel Bag! Our very own top quality classic medium sized thud juggling ball beanbag made of special artificial UV leather for a truly wonderful feel and an absolute joy to juggle with! These thuds are tightly filled with millet seed giving them a good firm round shape that ensures perfect travel through the air. This is especially vital when juggling 5 or more balls! The durable lining and the unique leather fabric makes these balls the most hard wearing and simply the best juggling balls we hold in our range! Flames N Games ASTRIX UV Thud Juggling Balls set of 5. 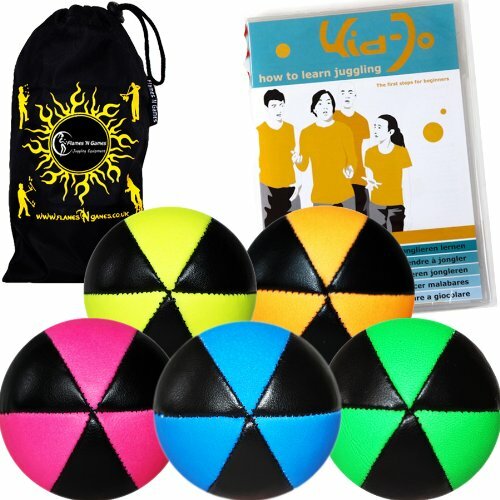 Pro 6 Panel Leather Juggling Ball Set + KIDJo Ball Juggling DVD of Tricks (5 languages) & Travel Bag! Our latest range of UV Thuds are of supreme quality and are a Dream To Juggle With! They are great for all levels of skill, from Beginner to Pro and an exellent choice for multi-ball juggling of 5+ Balls! **Visit our Flames 'N Games Amazon shop for loads more items, offers & great deals on Juggling Equipment! A Great DVD that starts you off from the basics and takes you right through to the more advances levels of juggling. References to 24 tricks. Extras: 1. Alan Blim 2. Beatbox - Stefan & Phillip 3. How to build your own Juggling balls "The 40 minutes are packed with a huge variety of juggling tricks and variations - plenty to keep beginners busy for a long time, without ever making them feel they're out of their depth." Gabi Keast "Kaskade" (European Juggling Magazine) Total running time 40min. Languages: English, Dutch, French, Spanish and Italian. If you have any questions about this product by Flames 'N Games Juggling Ball Set, contact us by completing and submitting the form below. If you are looking for a specif part number, please include it with your message.